While they are most commonly thought of as being used for servicemen and women killed during active duty, they are also used for any veteran whether they died during or after their service term ended. A U.S. burial flag is a symbol of honor for the services and sacrifices of the individual, as well as a keepsake for the family of the individual to treasure for years to come. This particular item is dear to Z Flag Store’s heart, we thank all of our service men and woman! We offer a range of options when looking for the right interment flag to honor your loved one. Offered in the standard size, of 5′ x 9′ 6″, for this need, these flags are made to offer a respectful and fitting honor with colors that are bold and vibrant. 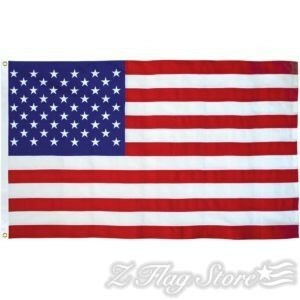 The flag itself is constructed from your choice of either nylon, cotton, or polyester. All of these materials are known to be long lasting without color fading to ensure a lasting tribute to stand the test of time. We offer government specified flags to meet any and all protocols in this area. When looking for a U.S. burial flag, our collection offers dependable and durable beauty fitting for this tribute at a great value. Made in the USA, these durable flags are folded and ready to display in a memorial case following the burial.